Finding the right bike can be tough sometimes. The bike you like might not have the right drivetrain, fork, or wheels. When this happens, you should just build your own bike. Bicycle frames are offered so you can build the bike of your dreams with no compromises. 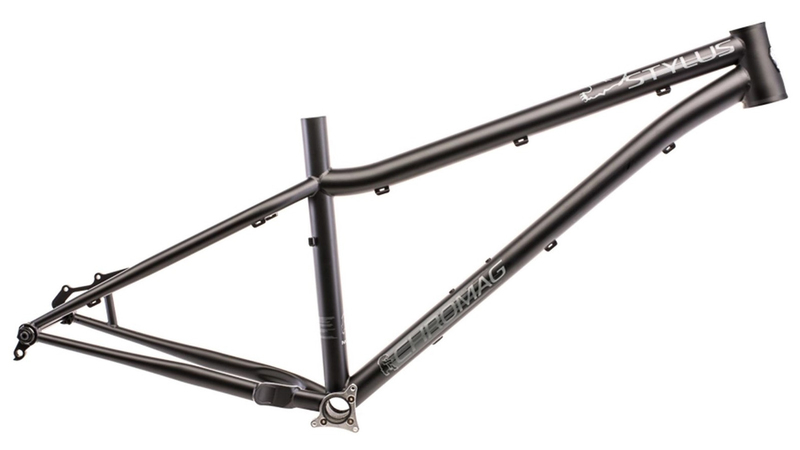 The Chromag Stylus Frame is a do everything bike that performs well while trail riding or freeriding. It is a steel frame that is optimized for a 160mm travel fork and uses 27.5 wheels. The frame has Boost hub spacing on the rear and has tire clearance for up to 2.6". If you're looking to build up a fun steel mountain bike for trail and all-mountain riding, then you'll love the Chromag Stylus Frame. 5'2" - 5'7" 5'5" - 5'10" 5'8" - 6'2" 6'0" - 6'4"
Previous model year Stylus frames have internal dropper post cable routing, but the current listing doesn't specify. Does the 2018 / 2019 Stylus have internal dropper post cable routing? These do have internal cable routing to help keep things tidy for the dropper. Hello, anybody rides this frame with 140mm fork travel? Thanks for comments on that!